The Harry Ransom Center at The University of Texas at Austin holds the archive of novelist Kazuo Ishiguro, the recent recipient of the Nobel Prize in literature for 2017. Ishiguro joins other Nobel laureates represented in the Ransom Center’s collections including Samuel Beckett, Pearl Buck, J.M. Coetzee, T.S. Eliot, William Faulkner, Gabriel García Márquez, Ernest Hemingway, Doris Lessing, George Bernard Shaw, Isaac Bashevis Singer, John Steinbeck and W.B. Yeats. “It is one thing for the Ransom Center to collect the papers of Nobel laureates and another thing entirely to collect the papers of future Nobel laureates,” said Stephen Enniss, director of the Ransom Center. 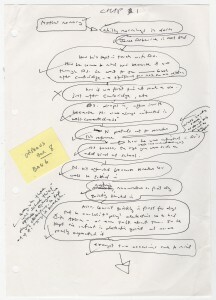 Acquired in 2015 with the support of then-university President Bill Powers and then-Provost Gregory L. Fenves, the archive provides a meticulous record of Ishiguro’s writing projects, including his seven published novels. 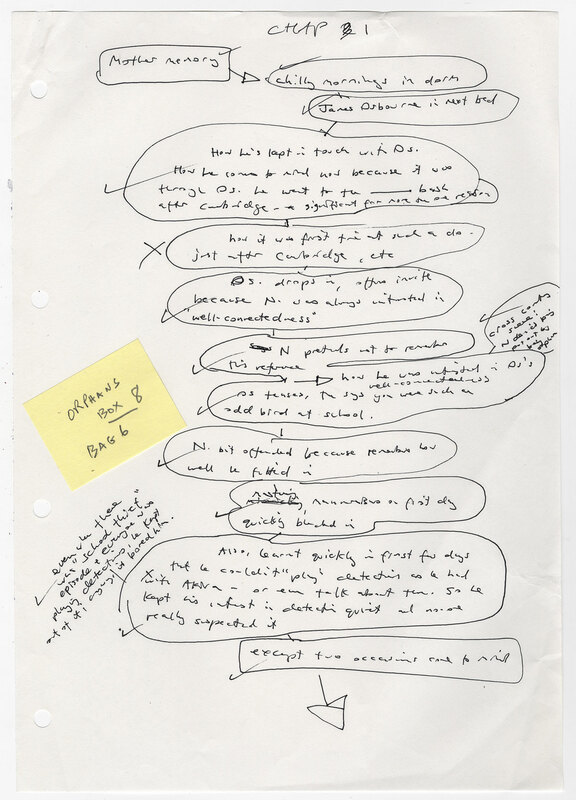 Ishiguro kept his notes and multiple drafts for each of his novels. 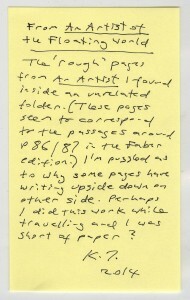 Prior to the archive’s arrival at the Ransom Center, Ishiguro spent months organizing the materials and making substantial explanatory comments, including a document he titled “HOW I WRITE,” which reveals his drafting process, and page-long documents titled “ARCHIVE NOTES.” These notes elaborate on materials in the archive, ranging from Ishiguro’s one attempt to keep a diary to two early unpublished novels. 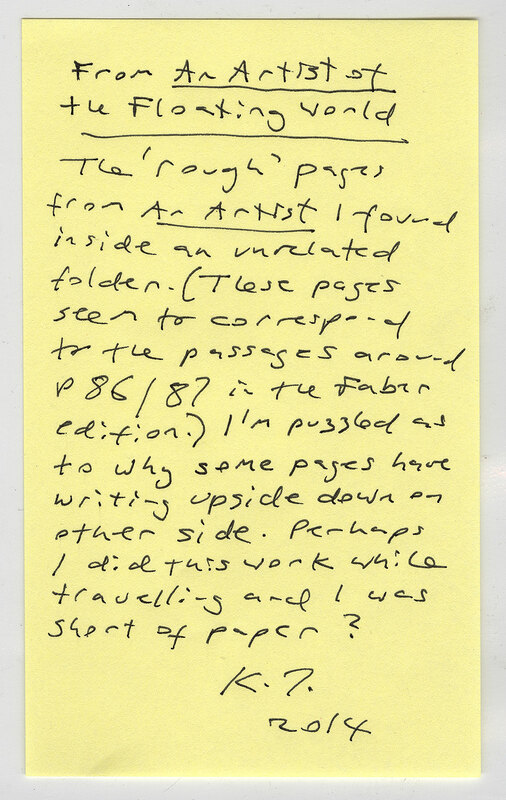 Throughout the collection are notes with Ishiguro’s annotations, providing a further commentary from the author about his papers and his career. “The papers offer a deeply intimate glimpse of Ishiguro’s creative process and his struggle to fashion each of his critically acclaimed novels. Rarely does an archive dramatize so fully the play of memory and its ties to the novelist’s art,” Enniss said. The collection is already accessed frequently by international scholars, students and faculty members, including Fenves (now UT Austin’s president), who led a session on Ishiguro’s “Never Let Me Go” with incoming first-year students in fall 2015. Fenves engaged students in a discussion about the book’s themes while exploring Ishiguro’s papers. A selection of materials from Ishiguro’s archive, including early items that showcase how Ishiguro found his voice and developed into a writer, are on view in the Ransom Center’s galleries through Oct. 31.